Allswell Vs. Nectar - Which Should You Choose? Home » Allswell Vs. Nectar – Which Should You Choose? Allswell Vs. Nectar – Which Should You Choose? The all-foam Allswell and Nectar are both affordable mattresses available for purchase online. Allswell is a new mattress brand from Walmart, while Nectar is a mattress brand devoted to the bed-in-a-box business model. Allswell also makes a hybrid foam-coil mattress, but this review will focus on the brand’s all-foam option. They are close in thickness. Both are made with materials of certified quality. Allswell is less expensive ($500 to $900 for Nectar; $345 to $585 for Allswell). Allswell is 12″ thick, while Nectar is 11″ thick. Allswell uses CertiPUR-US certified foam, which means its materials are considered more eco-friendly than typical mattress materials. Nectar has a cover that is OEKO-TEX® Standard 100, Class 1 certified. OEKO-TEX® is a respected independent environmental testing and certification system that tests to ensure textiles do not use harmful substances. Nectar offers a 365-day trial, which is longer than Allswell’s 100-day trial. 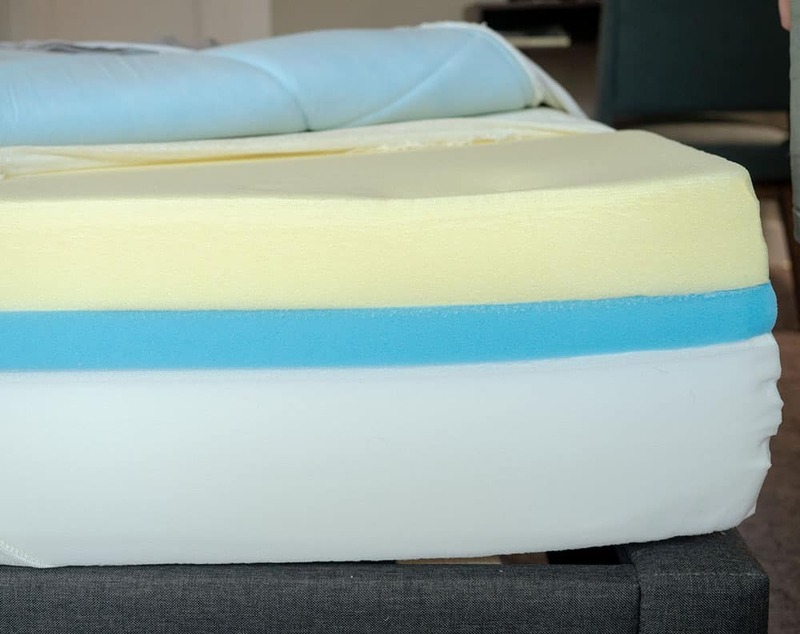 Deals: You can save $125 off the Nectar Mattress and get two free pillows by clicking HERE. Allswell has a woven fabric cover intended to have cooling qualities. It is also quilted with memory foam. On top is 1.5″ of a slow-responding memory foam. The second layer is 1″ of a firm, springy AirFoam material. A 3″ transition layer of SuperSoft foam comes next. A 5.5″ layer of firm, supportive foam comprises the base. Allswell uses CertiPUR-US certified foams, which means they are more eco-friendly than some other products. Read our full Allswell Review HERE. Nectar’s long staple cotton and Tencel cover is OEKO-TEX® certified, which means it does not contain harmful substances. The top layer is a quilted gel memory foam that provides comfort and breathability. The second layer is also made of gel memory foam. Nectar describes this foam as a “semi-open LUSH foam,” and it is typically manufactured for medical uses. This material is intended to absorb and redistribute heat. 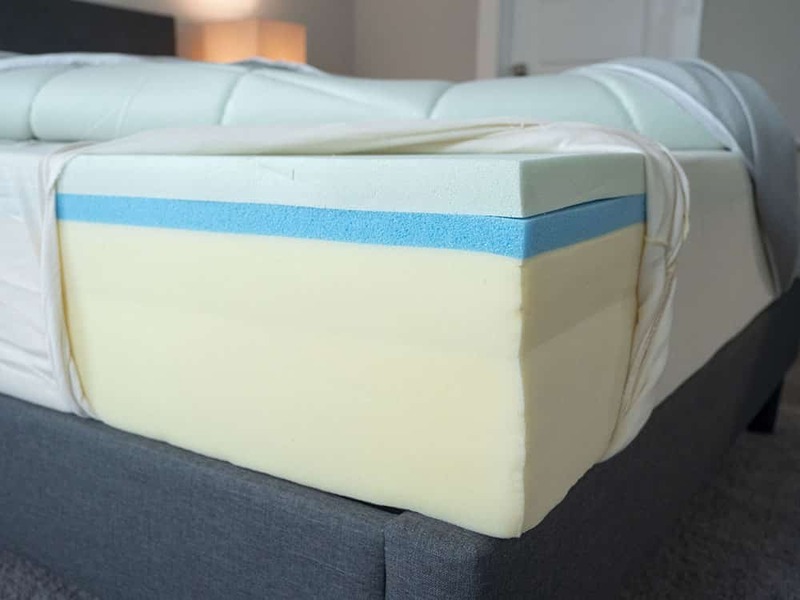 Next up, 3″ of Hi Core Adaptive foam gives extra support and lends the mattress bounce. This layer helps relieve pressure points through contouring support. A roughly 6″ base layer uses breathable yet dense foam designed to draw in fresh air through special channels. Allswell has three foam layers, while Nectar has four. Nectar has a bit more contouring support. They are of similar firmness, but Allswell is a little firmer. Allswell uses materials that are certified for environmental friendliness. Both are relatively firm and have good bounce, but Allswell is a little firmer. Check out our videos regarding the firmness and feel of both mattresses below. Both models prevent isolate motion well, and either would be a good option for couples. I can’t say that one is definitively better than the other in this case. Check out the motion transfer videos for both mattresses below. You want to save money. Allswell is less expensive, so if you really can’t decide then it will at least give you the chance to save some money. You sleep on your stomach. Allswell is a little firmer, which should provide stomach sleepers with adequate support so their spines don’t get out of alignment while they sleep. You sleep on your side. Nectar is just a little softer and has more contouring support. That makes it a more appropriate choice for side sleeping. You want to sink into your mattress more. Nectar is a bit softer than Allswell. If you like the feeling of sinking deeper into your mattress (rather than sleeping on top of the mattress), then the Nectar might be the better fit for you. These mattresses are in a similar prices range and have some construction similarities, but they offer different kinds of support. Hopefully this comparison has helped you determine which might be a better option for you. Please leave any specific questions about either brand in the comments.